Comprised of childhood drawings, unfinished sketches, and wacky musings, Red Rohl’s 2 year book project, Heavy Sketches Among Worldly Distractions, can be summarized in three words: adolescent, spontaneous, and ludicrous. It’s similar to the humor style of The 13-Story Treehouse series by Andy Griffiths in that it’s likely to amuse younger readers more so than older ones. However, this doesn’t mean there aren’t sections of intrigue for readers of all ages, as Rohl seamlessly incorporates autobiographical anecdotes and miscellaneous facts between cartoony doodles. Put together in a scrapbook format with a sketchy style, Rohl’s organization of this book is easygoing and interactive. The only con is that it is sometimes difficult to decipher, making the covered page overwhelming to focus on in a few sections. Horror vacui, meaning the fear of empty spaces (a term used in reference to visual art often when describing an artwork with little to no bare sections) is a fair description of Rohl’s youthful graphic novel. Each reader’s preference for this style will most likely vary. While mainly geared at children from eight to thirteen, some parents might appreciate a content warning, as some of the heavier subjects discussed feel questionable for readers under thirteen. Mentions of meth, even though discouraging its use, might not be considered age-appropriate by some parents. With cut and pasted drawings of pirates, zombies, Vikings, monsters, and Abraham Lincoln, accompanied by playful lettering and casual commentary, this unique memoir is fast-paced, conversational, and creatively compelling. 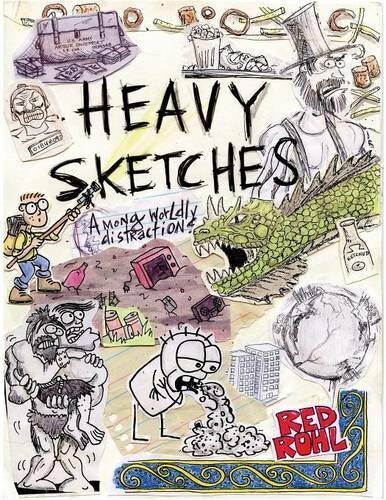 The perfect read for reluctant readers, Heavy Sketches Among Worldly Distractions captures and engages with overflowing pages of subtle educational facts and tidbits of random information, balancing plenty of humorous anecdotes, inspiration and advice for young artists, and somewhat heavier topics in a lighthearted and affable way. Includes some possibly frightening drawings (of zombies and monsters), as well as mentions of drugs and depression.